There are no simple answers when talking about Japan’s weather. Japan isn’t a country that wallows in eternal spring and summer, or simply splits its year between a wet and a dry season. Like its culture and language, the weather in Japan can get a little complicated. In Japan won’t find a simply-defined temperate country, but one straddling several climactic zones. Depending on where you go, your trip can fall anywhere between a cool humid temperate climate in the north in Hokkaido to a warm tropical rainforest in the south in the Yaeyama Islands. The massive variation can be quite surprising, especially if you’re used to the less extreme temperature differentials of nearby East Asian destinations like Hong Kong, Korea and Taiwan. Even with all the climactic cards stacked against me, I’m going to attempt to answer the question every traveller is asking: When is the best time to visit Japan? The verdict: When is the best time to visit Japan? 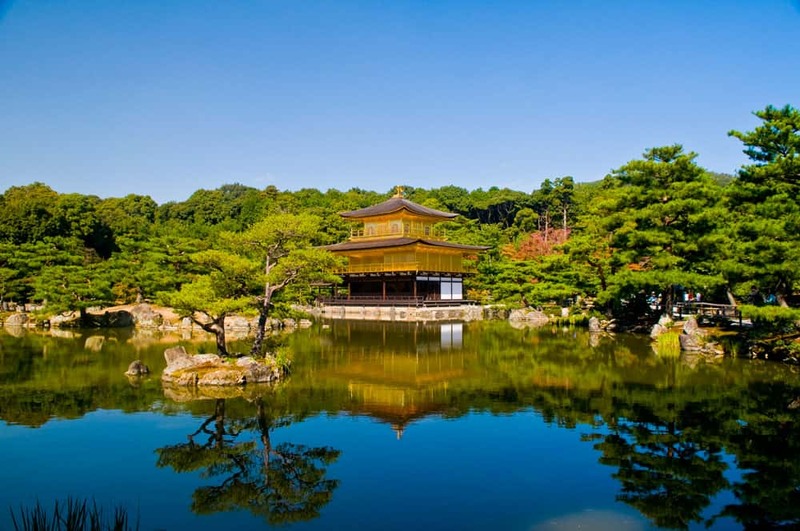 Why visit Japan in November? Why visit Japan in April? Weather in Japan fits into four distinct seasons: spring, summer, autumn, and winter. In general, summers are warm and winters are cooler throughout Japan. 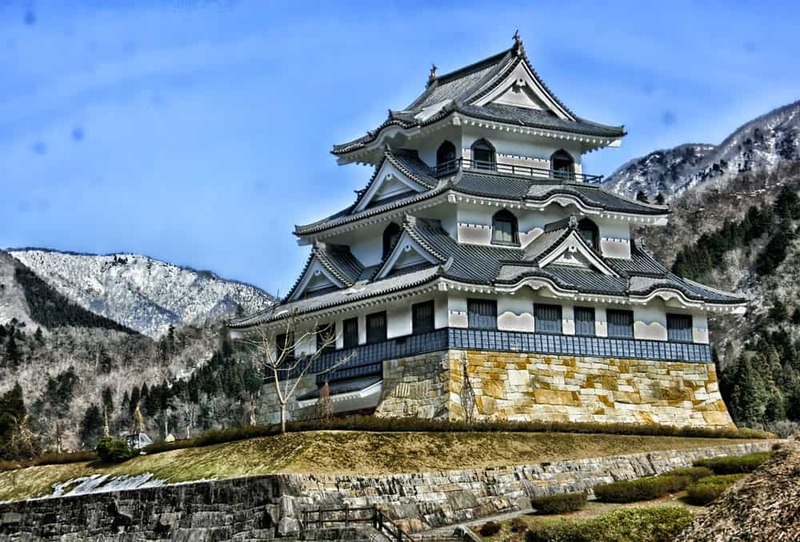 Unfortunately, this fact isn’t much help for planning a trip to Japan as the climate varies significantly as you travel throughout the country. 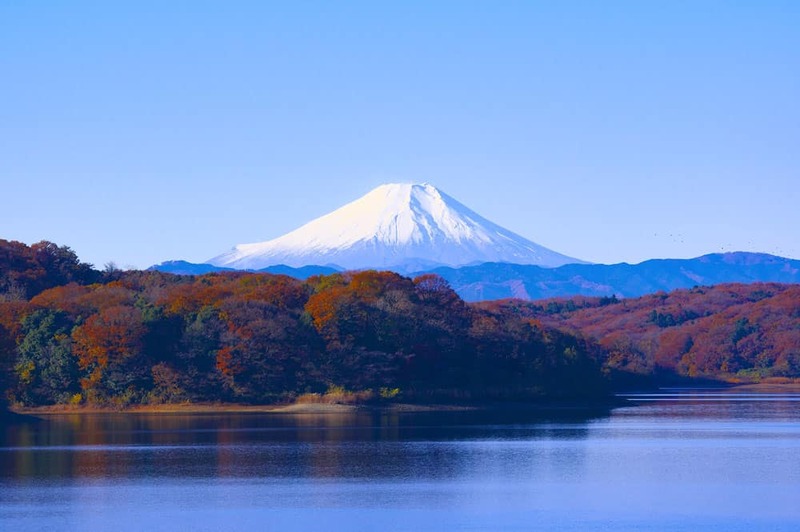 While it won’t substitute digging deeper into the weather of each region and checking Japan weather forecasts before you head out, below I’ve provided a general overview of weather in Japan throughout the year, first by season then by month. In the different sections, you’ll find recommendations on where to visit in Japan and what to wear to help you plan your Japan itinerary whenever—or wherever—you decide to go. Ready to travel to Japan? Don’t forget to protect yourself with travel insurance! When is spring in Japan: From March until May. What to expect in spring in Japan: Coming off of winter, the temperatures in Japan begin to rise. Early spring remains cool in the north while the south begins to return to its balmy warmth. Spring is one of the best times to visit Japan as the plum and cherry blossoms are in full swing. What to wear in Japan in spring: In most of Japan, you can get away with a lightweight rain jacket or light sweater during spring. The lightweight, but warm, Helly Hansen Men’s Dubliner Rain Jacket or Helly Hansen Women’s Laurel Long Rain Jacket would work well. For northern Japan, a softshell coat or fleece jacket worn in layers with a sweater would suffice on most days. Visiting Japan on a time crunch? Maximize your vacation with this complete one-day Kyoto itinerary, one day in Osaka itinerary, and our 24 hours in Tokyo itinerary! When is summer in Japan: From June until August. What to expect in summer in Japan: The beginning in June is one of the rainiest times in Japan during the entire year. Although rainfall drops, the summer in Japan is generally super hot and humid. Finding adventures in the cooler mountain areas makes travelling more comfortable in summer. What to wear in Japan in summer: In the dead heat of summer, you’ll want to go light. Aim to bring along lightweight travel clothes that will keep you cool in the humid weather. You should also, surprisingly enough, pack a light sweater or cardigan in one of these recommended travel daypacks for the over-air-conditioned restaurants and stores you’ll find all over Japan. Since rain is inevitable in Japan’s summer heat, bringing along an ultralight rain jacket is also a great idea. When is autumn in Japan: From September to November. What to expect in autumn in Japan: Temperatures throughout Japan begin to recover from the extreme heat of summer. Fall is one of the best times to travel around Japan as you’ll get to relax in cool breezes among the changing leaves. What to wear in Japan in autumn: Similar to spring, you’ll want to pack a light jacket and light sweaters in your travel backpack. The Columbia Ascender Men’s Softshell Jacket and Columbia Kruser Ridge Women’s Softshell Jacket are perfect for autumn in Japan. During the day, you should be able to get away with a long-sleeved shirt or even t-shirt on warmer days. You should plan to dress in layers, just in case. As autumn is one of the best times of the year to hike in Japan, don’t forget to pack a good pair of hiking shoes. Gearing up for autumn hiking in Japan? Check out our top picks for the top trail hiking shoes for men and the top trail hiking shoes for women! When is winter in Japan: From December until February. What to expect in winter in Japan: Winter is, as expected, the coolest time of year in Japan. It’s generally the driest season with the exception of Hokkaido where snow falls regularly giving a nice gift to winter sports enthusiasts. What to wear in Japan in winter: Beside your usual indoor clothes, you’ll need a warm overcoat and some warm sweaters in most areas of Japan. You should be able to get away with something like the Columbia Bugaboo Interchange Jacket with a waterproof outer shell and removable fleece liner perfect for taking on Japan’s slopes. There’s also a Columbia Bugaboo Jacket for Women available. The exception is the southern islands where you should be able to get away with a light jacket or sweater. Overview: The weather in Japan in January is generally dry and sunny. With the exception of New Year, the crowds in Japan are smaller than in other months. Average lows are between -8ºC in Sapporo to 14ºC in Naha with average highs of -1ºC and 19ºC. Where to go in Japan in January: Northern Japan sees a lot of snowfall, making it the perfect destination for winter sports. If you want to escape the cool temperatures, Southern Japan is relatively mild at this time of year. Overview: Not all that different from January, February is wonderfully dry and sunny throughout most of Japan. Average low temperatures hover between -7ºC in Sapporo to 14ºC in Naha. Average highs are between 0ºC and 19ºC from north to south. Where to go in Japan in February: Like January, aim for the winter sports wonderland of Hokkaido or the alpine regions. Seeing small Japanese villages blanketed by snow or dipping into an authentic onsen experience with slightly milder temperatures than January make February the perfect month for anyone wanting to visit Japan in winter! Overview: The weather gets much milder in the first official month of spring in Japan. Plum trees and cherry blossoms start to bloom near the end of the month. Average lows drop anywhere from -4ºC in Sapporo to 16ºC in Okinawa while average highs throughout Japan sit between 4ºC to 21ºC. Where to go in Japan in March: The winter sports season in Japan is at its tail-end during March. Most Japanese cities begin to de-thaw from winter and are pleasant to walk around as long as you’re properly dressed for the weather. Avoid travelling towards the end of the month as school holidays kick in. 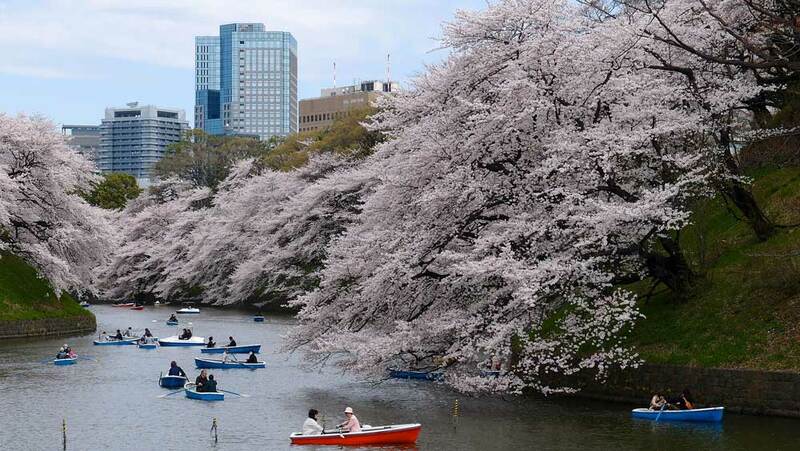 Overview: Even milder than March, April is one of the best times to visit Japan. By now, the cherry blossoms are out in full force, busting out incredible scenes all over the country. Average daytime highs jump up to 11ºC in Sapporo and 24ºC in Naha while average lows sit at 3ºC and 19ºC. Where to go in Japan in April: Other than Hokkaido, nearly everywhere in Japan is in bloom by April. 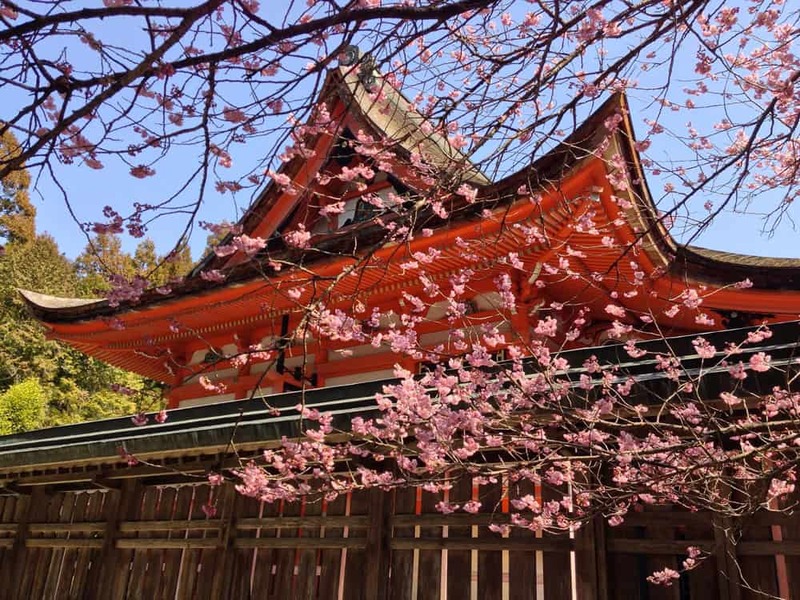 In fact, April is perhaps the best time to visit Tokyo and other big Japanese cities for its combination of mild temperatures and drier conditions. It’s a busy time of year as late April brings Golden Week, the biggest domestic travel period of the year. You should book well ahead of time if planning to travel anywhere in Japan during this time. Overview: Temperatures continue to rise into May, making the month one of the most pleasant to travel. The vegetation throughout Japan has already become thick and lush. Temperatures averages hover between lows of 8ºC and 22ºC, and highs of 17ºC and 26ºC in Sapporo and Naha respectively. Where to go in Japan in May: Most of Japan is pleasant to travel through in May with the exception of Okinawa where the rainy season is starting. The crowds are smaller during May (except for Golden Week at the beginning of the month). Tackling Japan’s busiest tourist areas is smart at this time of year. It’s the perfect time to dig into all the best things to do in Kyoto and check out the top attractions in Osaka. May is the perfect time to start flexing your Japan rail pass. Overview: Rainfall picks up significantly in early June as the rainy season hits Japan. The temperatures also begin to climb from the mild weather of May. Average lows across Japan range from 12ºC in the north in Sapporo to 25ºC in the south in Naha, while highs hover around the 21ºC and 29ºC for the same cities. 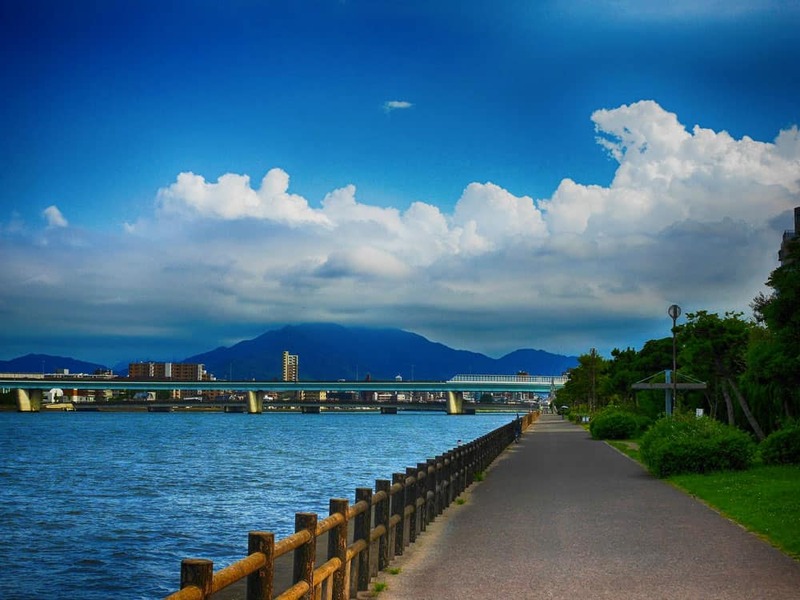 Where to go in Japan in June: Hokkaido is the driest Japanese tourist destination during June, and one of the most pleasant places to visit in Japan at this time of year. Escaping cities like Tokyo, Osaka, and Kyoto for hot springs resorts is a good idea in June. Overview: Rainy season is all but finished by the end of July. Throughout Japan, the heat and humidity in July can be off-putting. Temperatures rise even more with average lows in Sapporo sitting at 17ºC and at 26ºC in Naha. High temperatures are even bigger with Sapporo hitting an average of 25ºC and Naha blazing at 31ºC. Where to go in Japan in July: Finding refuge at higher elevations will keep you cool during the heat of July. Launching a one week in Hokkaido itinerary (or more!) is a great choice at this time. Be sure to plan your trip to Japan around the school holidays, which start in late July and extend into August. Gearing up for the wet Japanese summer? Check out these men’s rain jacket reviews and women’s rain jackets reviews! Overview: Like July, August is hot and humid and generally uncomfortable to travel in. Towards the end of the month typhoon season starts to roll in. Needless to say, this is not an optimal time to travel! Average temperatures soar to average lows of 19ºC in Sapporo and 26ºC in Naha with average highs of 26ºC and 31ºC. Where to go in Japan in August: With central Japan mired in extreme heat and humidity, Hokkaido and other elevated areas are your best bet for staying comfortable. August is high season for Japanese domestic travel. If you’re looking to snag one of the best places to stay in Kyoto, ensure you book well ahead of time. Overview: The heat and humidity continue into September with a little respite. Typhoon season is usually in full swing, slamming the coast in a flurry of foul weather. Average temperatures throughout Japan range from lows of 14ºC in Sapporo and 25ºC in Naha to highs of 22ºC and 30ºC respectively. Where to go in Japan in September: With the possibility of typhoons, the coastal areas aren’t the most pleasant places to visit in Japan in September. Travelling to Honshu, Japan’s main island, or Hokkaido works better. By September, high tourism season is over, and you’ll enjoy a little extra breathing room. 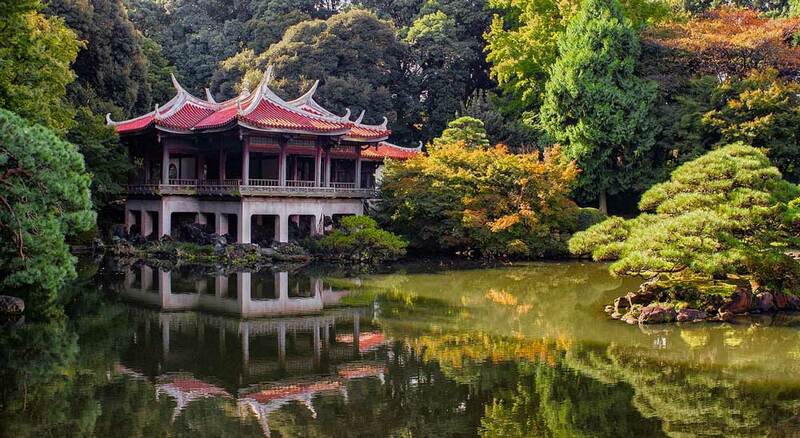 Digging into Tokyo’s best tourist attractions is great at this time of year. Spending time in Tokyo? Leave some extra time to check out some awesome day trips from Tokyo! Overview: In October, Japan becomes more comfortable to travel in thanks to a reduction in the heat and humidity. The weather is still warm enough to enjoy yourself outside without covering up too much. Average temperatures get as low as 7ºC in Sapporo and 23ºC in Naha while highs hover around the 16ºC and 28ºC marks. Where to go in Japan in October: October is one of the best months to explore Japan to its fullest. Although the far north of Japan starts to get a little cooler, the early explosion of fall colours makes a good argument for October to be the best time to visit Hokkaido. Staying in the three major tourist cities—Tokyo, Osaka, and Kyoto—is more comfortable in October than in September. Overview: For its mild temperatures and low rainfall, November gets huge stars for travelling to Japan. By now, the leaves have erupted into a torrent of fall colours. High season is officially behind you, and you’ll find Japan much quieter than in other times of the year. Average temperatures dip to lows of 1ºC in Sapporo and a still comfortable 20ºC in Naha. Average highs of 8ºC in Sapporo and 24ºC in Nara really begin to show the temperature gap between Japan’s north and south. Where to go in Japan in November: Hokkaido’s plummeting temperatures might be a little off-putting for most (non-Canadian!) travellers to Japan. Honshu is still relatively mild in November and is the perfect place to witness the autumn colours in full force. 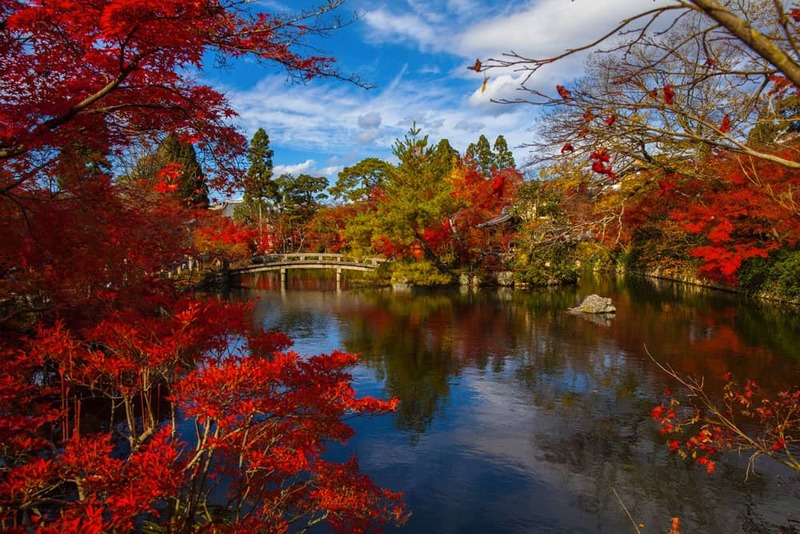 Under the fall colours, this could very well be the best time to visit Kyoto! With the relatively lower tourist numbers, this is also the perfect time to stay in Tokyo at relatively more reasonable prices. Overview: Colder than November but still dry, December isn’t such a bad time to travel to Japan. Average temperatures start to dip even more with Sapporo seeing lows of -4ºC and Naha hitting 16ºC. Average highs in Sapporo only reach a chilly 2ºC while Naha still reminds us of spring at 21ºC. Where to go in Japan in December: If the colder temperatures don’t bother you, the cities of Honshu should be quiet during most of December. Northern Japan is a little too chilly for most casual travellers. But the end of the month sees the winter sports season gearing up; it’s the perfect time to launch a Hokkaido itinerary! For a true escape from the cold, head down to the warmer climes of Okinawa. The best month to visit Japan is either November or April. Overall, travelling to Japan in November is your best choice. The biggest reason is simple: the weather. Unlike the wet, hot and humid months that precede it, November is an excellent compromise between warmth and dryness. Sure, November in most of Japan isn’t filled with balmy t-shirt-wearing days. But what you’ll lose in heat you’ll make up for in both lower precipitation and elbow rooms. And let’s not forget the fall colours Japan is famous for. November is the perfect time for that, too! It can be a real toss up here. Although November might inch out April by a slight margin, it’s easy to see why travelling to Japan in April is also fantastic idea. First, there’s this: April is the best time to witness Japan’s famous cherry blossoms in full bloom. Walking the streets of Kyoto or through a park in Tokyo at this time of year is an experience everyone should have in their life. And then there’s the weather. Along with November, April is one of the most comfortable months. There’s relatively little rain in most areas of Japan in April and the temperatures in most Japanese cities are mild. The only downfall of travelling to Japan in April is the crowds. With the cherry blossoms in full swing, spring school holidays, and Golden Week, April can be a busy time in Japan. It’s because of this that you’ll need to prepare well ahead of time if planning to visit Japan in April.